That all sounds great... But what does it actually taste like? 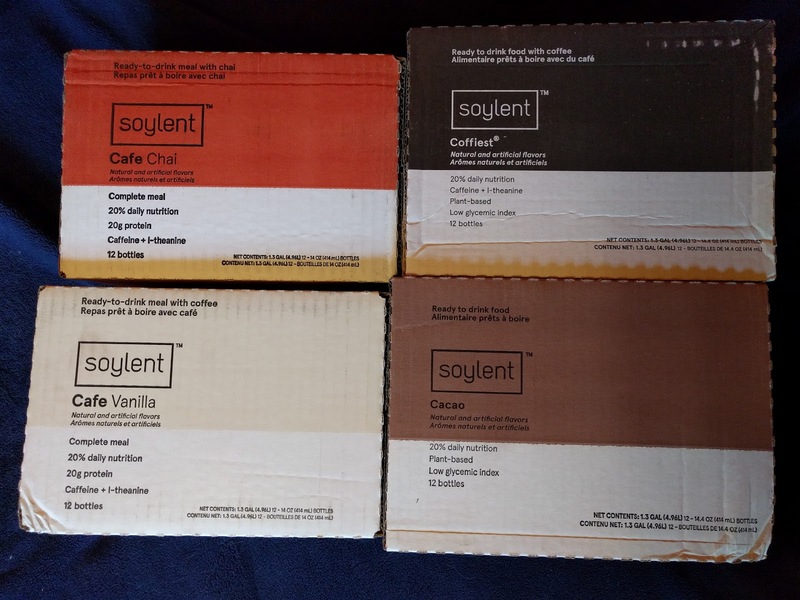 I placed a new order earlier this week for one 12-bottle box each of Soylent Cacao (seriously, that stuff is actually quite tasty! ), Coffiest, Cafe Vanilla and Cafe Chai. Only two days later, the package showed up on my doorstep and I was able to see what I got. I will take a moment to comment on the packaging: the Cafe Vanilla and Cafe Chai flavors came in smaller, more square bottles, and their boxes were correspondingly slighter smaller as well. They also have the nutrition facts and ingredients lists right on the bottles themselves, whereas the Coffiest and any other Soylent flavor I've tried thus far omitted this. 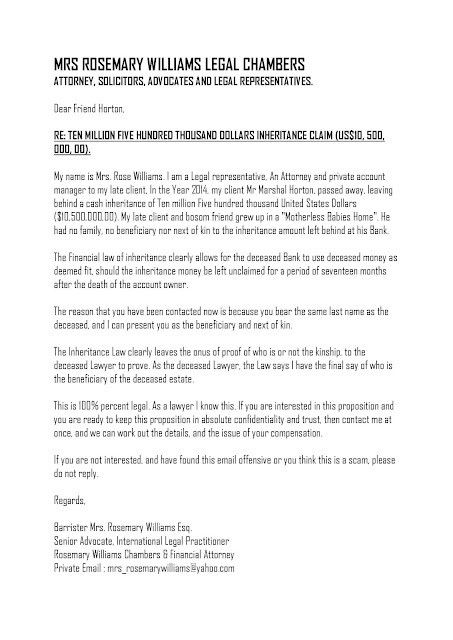 All of them still have that information on the boxes. In addition, the Cafe Vanilla and Cafe Chai flavors are sealed with a plastic ring similar to what's found on most plastic bottles in general; the Cacao and Coffiest bottles still have the outer plastic wrap extend up over the sides of the caps and have perforations for tearing off. I will critique each of the three Cafe flavors below in the chronological order in which I tried them. Soylent Chai was the first one I tried, almost as soon as I had opened the box. 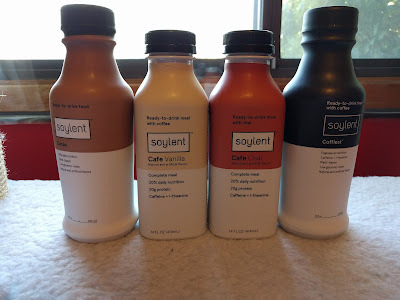 Appearance-wise, it looks just like regular Soylent to me. However, I could definitely taste the cinnamon flavoring one might expect from chai tea, and it seemed slightly sweeter than regular Soylent. It was a very pleasing flavor overall. I could definitely see myself having this for breakfast some mornings when our older cat Shimmer drags me out of bed at 7:00 AM to feed her. Next up was Soylent Cafe Vanilla. This one surprised me in a couple ways, in that it looked slightly darker than I was expecting (I guess the packaging color scheme prepared me for a lighter color), and that I could not detect much vanilla flavoring. I definitely did taste the coffee in it though, but it wasn't overpowering. 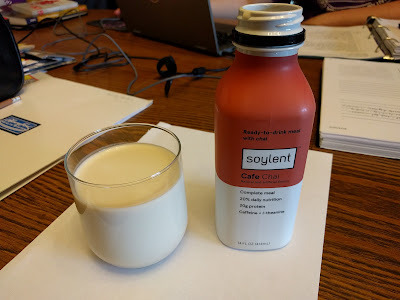 It was enjoyable, and I think I prefer it slightly to Soylent Cafe Chai as a matter of personal preference. This was the last "new" flavor I tried. It was quite good; I could definitely taste the coffee in it. However, I could not distinguish the difference in flavor between this and the Cafe Vanilla flavor. 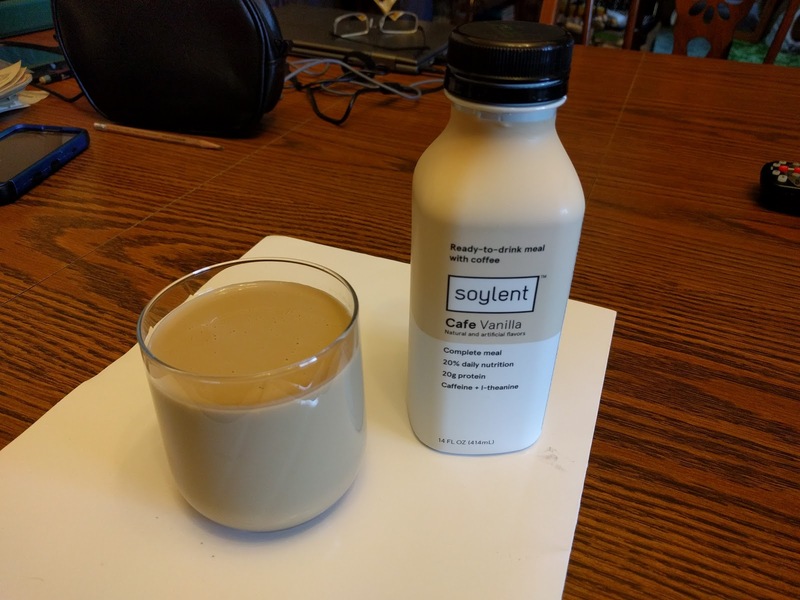 Maybe I need to try a little bit of both one right after the other in order to taste the difference, but right now I think this basically shows that Soylent needs to add more vanilla flavoring to the Cafe Vanilla flavor. 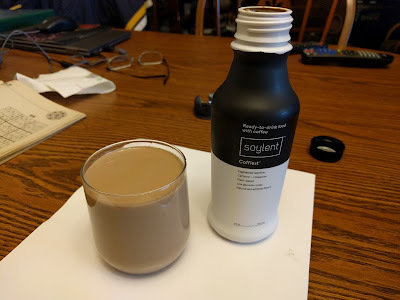 Overall, I enjoyed all three Soylent Cafe flavors (but wish the Cafe Vanilla's vanilla taste was more pronounced), and I think they are at least worth trying for yourself. Thanks for your message of Love (we hope)! Use coupon LOVE for 20% off any new subscription. 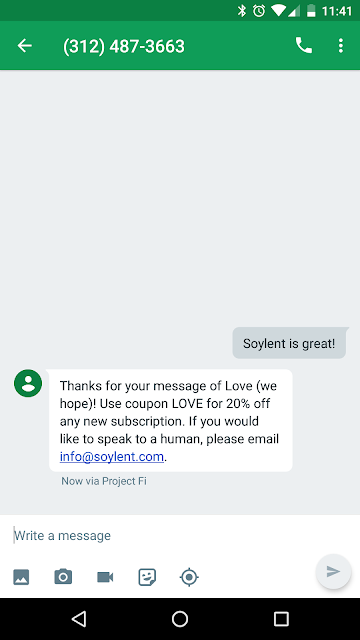 If you would like to speak to a human, please email info@soylent.com. So, you get a promo code for new subscriptions and a way to contact them directly. Neat!